Hey. New Photo! I did it! I took this photo while I was at school today. In fact, I’m still at school. My friend Kris and I will be attending a scholarship dinner tonight in Abbotsford, so we decided to stay late, get some work done (or in this case, some photography), go to dinner, then go home. 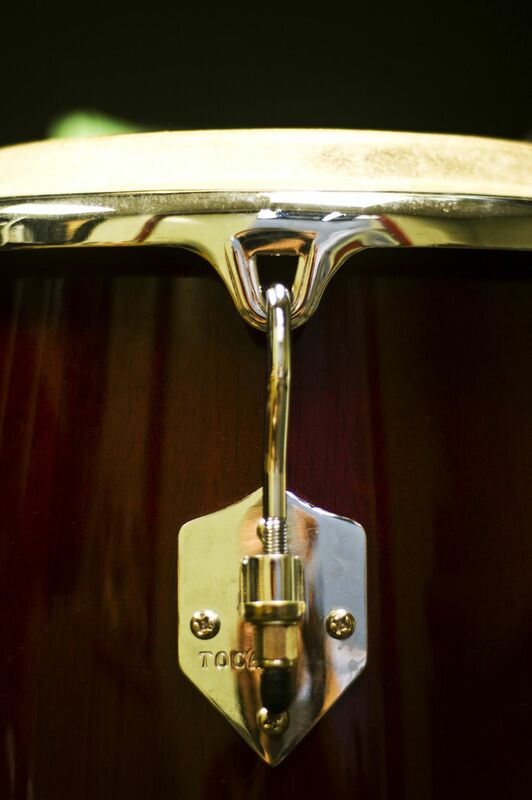 This is a “lug” on the side of a conga drum in our band room. I, once upon a time, wanted to be a drummer. What I found was that my feet work or my hands work, but they don’t like to work together. Yes, I can walk and move my arms, but anything more demanding than that and all heck breaks loose. So I accepted my lack of coordination and moved on. My obsession with things that make loud noises, however, has never been stronger. Anyway, I’m off to Indian food for dinner. Or, in other words, I’m off to show my stomach who’s boss and ingest more butter chicken and rice and naan bread than I really should. June 23, 2011 | Categories: Uncategorized | Tags: Band, Food, Life, Music, photography, Photos, Pictures, postaday2011, Random, school | Comments Off on Hey. New Photo! I did it! 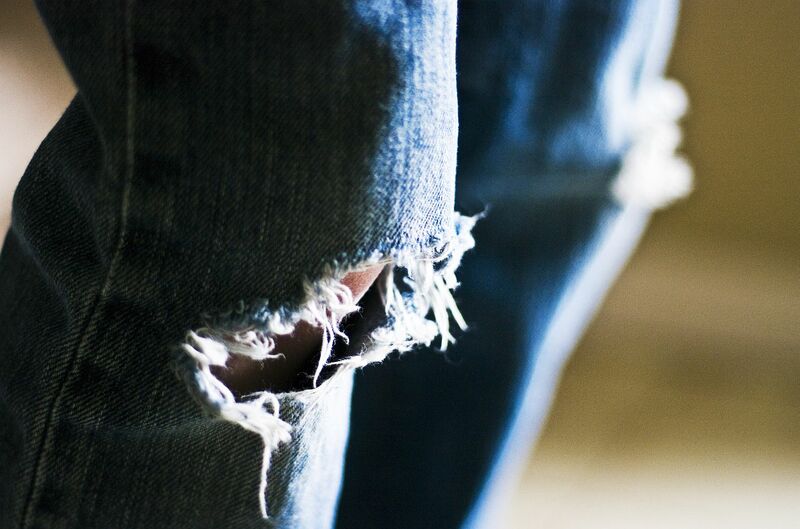 These are my son’s jeans. They are worn out – in the knees, anyway. My wife, with her wonderful sensibility, has relegated these jeans to only certain jobs, like washing the car, working or playing in the yard, and (maybe) visiting family on the weekend. Definitely not church or school functions. For me, they bring me back to my style of clothing in twelfth grade. My “uniform” in my grad year was worn-out, torn jeans and offensive t-shirts, somewhat hidden under plaid, flannel shirts. I looked like a refugee from a Nirvana concert. Yup, so cool. Oh, and this week’s photo challenge on WordPress is Worn. Check it out. I am not the person who likes to put himself in front of the camera. I smile uncomfortably. I rarely get a shot of myself that I appreciate. I blink at the inopportune moment. I don’t like photographing myself. So this shot, above, is a departure from the norm. I set up the shot, changed the aperture, shutter speed, white balance and got the focus just right and handed the camera to my friend Ali. 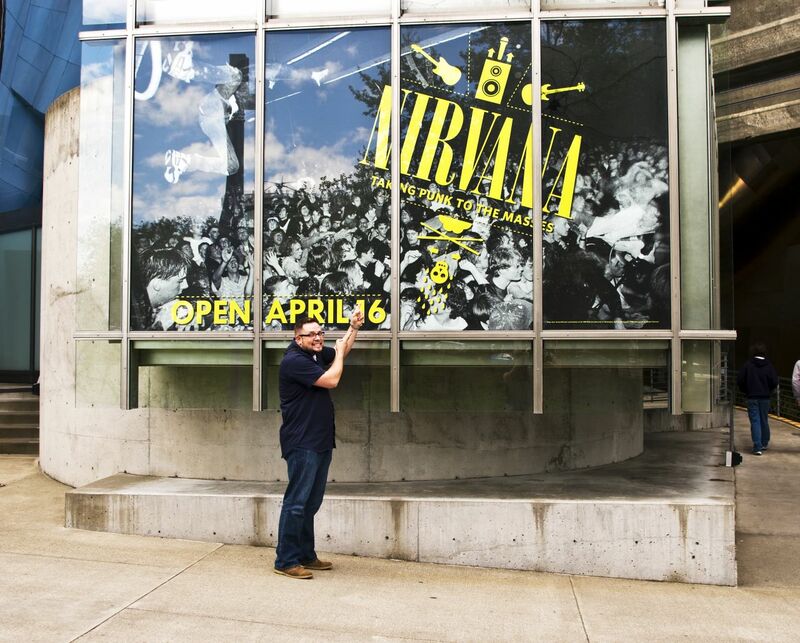 She snapped my shot of me, pointing at the Nirvana exhibit window treatment at the EMP. I have to admit to a certain geeky joy, a geeky emotional response to my high school grunge heroes. That smile looks painted on, but is as real as could possibly be. It’s like they have some kind of underground magnet that helps them find their bands; something that locates amazing musicians, singers, songwriters that don’t feel like they’ve been pumped out of some popular music factory. They are, thankfully, not in the business of mindless pablum that passes for popular radio fare. They are, thankfully, responsible for thoughtful, soulful, genius acts of wonder. 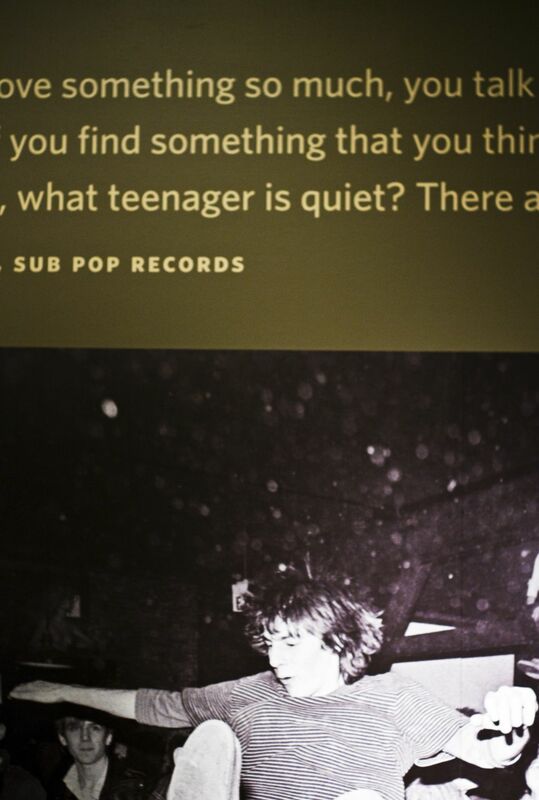 Thanks, Sub Pop, for making me a loud teenager, even at 37. I find that taking photos of other photos is a bit weird. Someone already took a brilliant photo, and I’m piggy-backing on their genius. At the same time, I want a record of my own experience. In this case, my fellow teacher and friend Kris asked me to accompany him to the Experience Music Project in Seattle today. 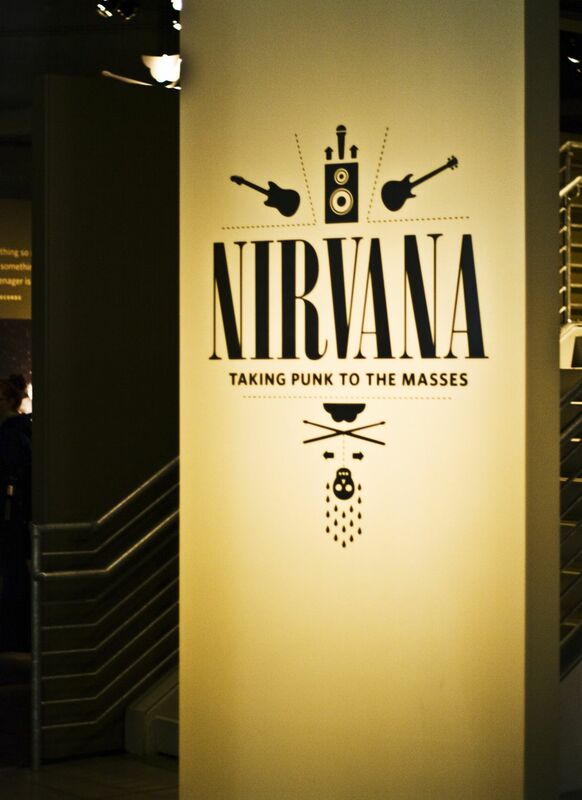 To my delight, EMP is showing an exhibit called Nirvana; Taking Punk to the Masses right now and it is an account of my high school experience through the music of the time. The end of the ’80’s and beginning of the ’90’s saw the advent of the grunge music movement and I felt like I’d moved back 20 years. 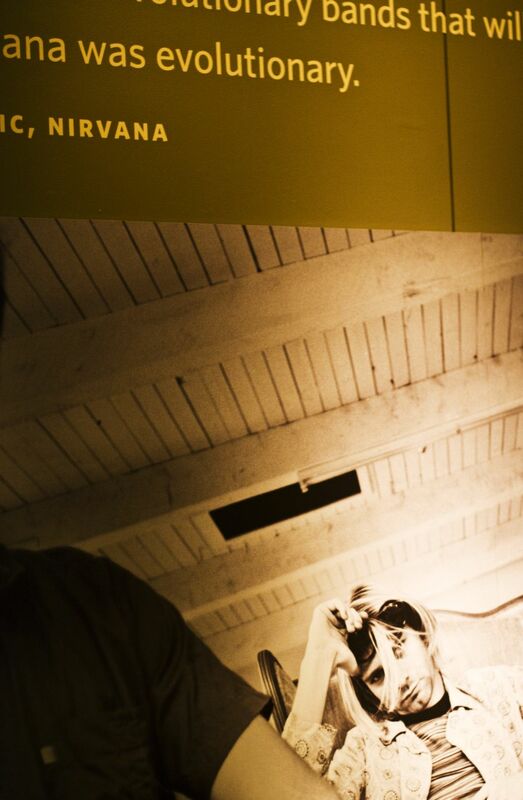 I was surprised by how emotional the experience was. If you’re in your 30’s and actively participated in the music of the Seattle music scene from twenty years ago, I highly recommend that you see this.